This Fundraising Campaign is in support of the students at Zhingwaako Za’Iganing School in the small semi-remote Anishinaabe (Ojibway) community of Lac La Croix First Nations. We are located in the Rainy River District of Northwestern Ontario, Canada, along the Ontario-Minnesota border. 1) Funds raised will be used to purchase a van for students to share their culture, language, pride and talents, and a message of inspiration and hope with other youth both on and off reserves. Through their current experiences, students are proud of their accomplishments and are learning that the power of their voices can be the heard, create awareness, and inspire change. Transportation will also provide the students to access and be involved in arts and cultural experiences outside their community. 2) Should functioning, mainstream internet be brought into the community, partial funds from this campaign may be allocated to provide technology support (hardware, software, resources) to allow the students access resources through the internet to become 20th Century learners and to develop employability skills required in todays’ society. 3) Additional funds will be used to set up a scholarship fund to support graduating students who have been involved in the arts program and are pursuing post-secondary education (with additional criteria determined by the school). In Zhingwaako Za’Iganing School, students have been involved with the program “Outside Looking In (OLI)” as an extra-curricular program to engage and retain youth in completing high school. In February, 2018, the school was the recipient of a MusiCounts Canada grant with which we purchased instruments to start a formal music program. 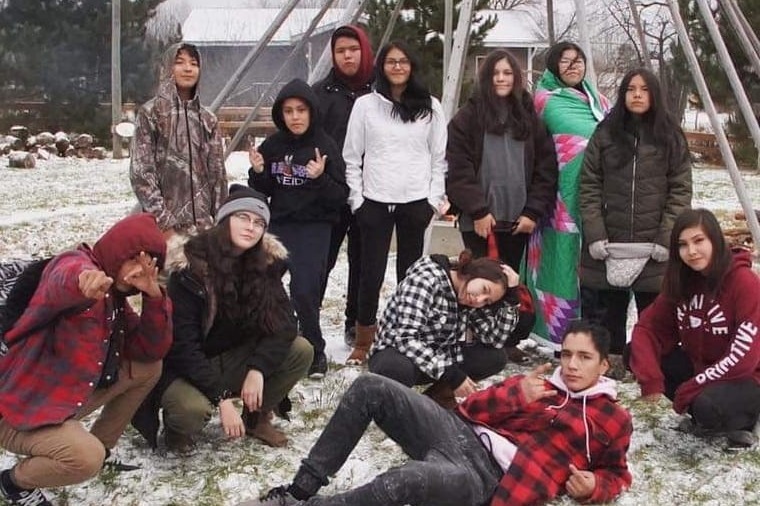 Additional arts education funding (Ontario Arts Council, Treaty 3, and Seven Generations Education Institute) provided the opportunity for artists in residence (N’we Jinan Artists) to work with the students to produce the “Firemakers” video. We continue in our commitment in developing, expanding and sustaining our arts education program for our students. The arts are an integral part of this community’s culture and traditions. Arts in education provide students with the opportunity to explore and express themselves and their creativity ( http://www.unesco.org/new/en/culture/themes/creativity/arts-education/) in addition to other benefits determined by research). We thank you for your contribution to support our students in being “Firemakers” and inspiring others such as yourself in creating change and opportunities that otherwise would not exist. Hey everyone....we have been graciously given funding to get us to a conference in Calgary in less than a month. With that being said, we would love to use this money to do some educational activities while we are there! If you can help us in anyway make this happen, we would really appreciate it! Miigwetch!! !